A 45-minute spin class can burn from 350 to 600 calories. Spinning is an excellent way to burn calories, build endurance and strengthen and tone your muscles. Spinning classes use bikes, which have various tension levels that simulate the experience of riding an actual bicycle. Spin instructors guide participants on a “virtual” outdoor ride, with hills, valleys and straight-aways. 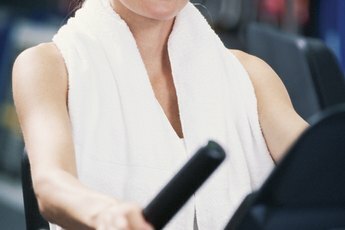 The repetitive activity of spinning can lead to injuries. Your knees are susceptible to spinning injuries because of the high repetitions and the vigorous, fast-paced pedaling that the exercise requires. To reap the full benefits of spinning, correct bike setup is key to minimize your risk of injury. Adjust your seat height. If your spinning bike is not set up properly you may develop knee problems. Adjusting your bike’s seat height is a simple way to prevent knee pain. To determine the right seat height, place your feet in the toe cages or clip into the pedals and rotate the pedals until one leg reaches the bottom of the pedal stroke. That leg should have a slight 25 to 35 degree bend in the knee. Adjust your foot position. If toe cages and straps are used, you should align the ball of your foot over the center of the pedal. If you use clipless pedals, make sure that your cleats are aligned properly on your shoes so that the ball of your foot is positioned on the center of the pedal. 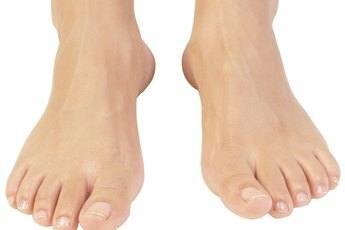 Pedaling with your heels flat and a slight bend in the knee will get you in the proper foot position. Adjust your seat position. In addition to adjusting seat height, you are able to adjust the seat position on spin bikes. The seat adjusts forward and backward so that your knees will be properly aligned relative to your feet. First you want to sit on the seat with your hands on the handlebars and the balls of your feet over the center of the pedals. Your seat is in the right position when your kneecap is directly above the center of the pedal. Pay attention to your form. 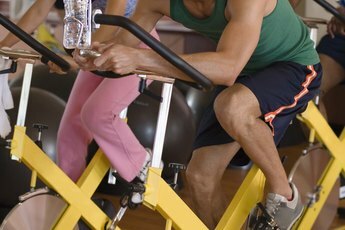 Spinning classes often require you to pedal while standing, which can put stress on your knees if your form is incorrect. Keep your feet under your knees and your knees under your hips. Try not to bounce during upright portions of the class. During seated positions, grip the handlebars lightly and avoid leaning on the handlebars. Doing so can cause your pelvis to tip upward and ruin your form, causing your knees to work harder. Your knees should be in line with your ankles when you pedal. Try not to let your knees stick outward from or inward to the bike. If this happens, you will likely experience knee pain. Know your limits. To avoid knee injuries, concentrate on exercising at your own pace. Do not be intimidated by the high speeds and furious pedaling of your spin mates. Listen to your body and adjust the tension and speed accordingly, and do not be afraid to slow down or take a break if you need to. Warming up and stretching before and after spinning will reduce your risk of knee injuries.